Now a national brand, the Cabot Creamery is a shining example of the cooperative way of doing business: caring for the land, for its farm family members, and for the local communities where we live and work. Our success is measured by more than profits; it’s also measured by our commitment to social and environmental responsibility. Cabot’s community outreach and educational programs – which include working with business and consumer groups from the National Cooperative Business Association, the Consumer Federation of America, and the Girl Scouts of America – are a source of Co-op pride that have earned us even more awards. 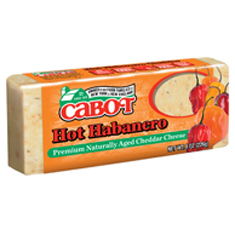 The Cabot Visitors Center, at Cabot Village in Cabot, VT, is stocked with all of Cabot’s fine products, from our classic cheeses (available for sampling), sour cream, yogurts, and dips, to our limited-edition artisanal cheddars. Visitors can also watch a video tour of our cheesemaking facility and learn more about the history of the Co-op. 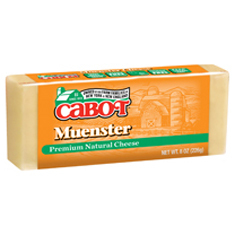 Our Farmers’ Store, located along Vermont’s Route 100 in the Stowe/Waterbury area, offers a fantastic selection of Cabot’s award-winning cheeses (available for sampling), along with other Vermont specialty foods, microbrews, hard ciders, and wines. 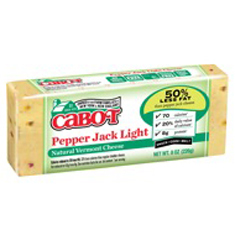 The Cabot Quechee Store is located in the Quechee Gorge Village on Vermont’s Route 4, just off Interstate-89, and also features cheese sampling. Quechee Gorge Village is one of Vermont’s premier shopping attractions, known for its many antique stores and other Vermont-based businesses. Our newest store is the Cabot Farmers’ Annex, on Commercial Street in Portland, Maine. You’ll find it nestled among the historic buildings of Portland’s Old Port shopping district, and brimming with a selection of fine Cabot products and Maine crafts. And for cheese lovers everywhere, Cabot products can be found in retail dairy departments and specialty cheese stores across the U.S.
Visit us at any of our four locations! 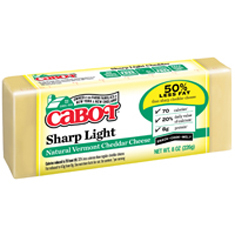 The finest cheddar cheese in the world is proudly made by Cabot Creamery in Vermont. 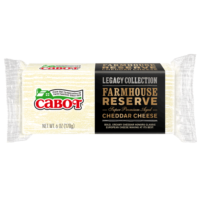 Using only pure, fresh milk provided by our farmer-owners, all of Cabot’s cheddars are made naturally, without chemicals or preservatives. We let time, gentle care and Mother Nature nurture our cheddars until they are aged for our specific flavor profiles. This cheddar offers subtle caramel sweetness with delicate hints of the duskiness of wine aging casks. Inspired by the best of British cheddars, our Lactose-Free White Oak honors balance, sharpness, and a smooth milky texture. We’ve crafted this special cheese similarly to Cabot’s 2013 American Cheese Society Winner, Clothbound Cheddar, but without the cave aging process. Available in 6-ounce Dairy Bars, our White Oak Cheddar is part of our special line of Legacy Collection cheeses. Savor the nostalgia of Cabot’s Founders’ Collection. These truly unique cheeses are made from the original recipes created by our founding farmers in 1919. Available in a 6-oz block, Orne Meadows will transport you back in time to the fresh rolling hills of early 20th century Vermont. It’s perfect for slicing and pairing, and its robust, sharp cheddar flair is delicious with muted crackers and warm breads. 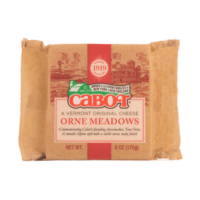 With a subtly sweet fruity and nutty finish, Orne Meadows is also a tasty choice for your next wine and cheese gathering. As big and bold as New York, this classic cheddar boasts a complex, layered sharpness. Rich flavors combine with a crumbly texture for a fresh-off-the-dairy-farm experience. Available in 6-ounce Dairy Bars, our Lactose-Free New York Vintage is part of our special line of Legacy Collection cheeses. We age our delicious Lactose-Free New York Extra Sharp Deli Bars for 12 months to achieve the perfect balance of tangy sharp cheddar and subtle undertones of grapefruit and bergamot. Enjoy a thick, hearty slice on your next sandwich or grate it over a steaming bowl of pasta for an extra zing. Or, cube it up and savor the simple, pure taste of New York on its own. A part of our unique Founders’ Collection, Lamberton is made from the original recipes created by Cabot’s founding farmers a century ago. 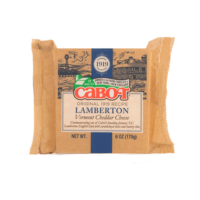 Lamberton is a traditional British-style cheddar, boasting a smooth, buttery undertone to its caramelized, sharp tang. Pick up a 6-oz block today and try a taste of the farm alongside crisp, sweet fruits like pears or red grapes. 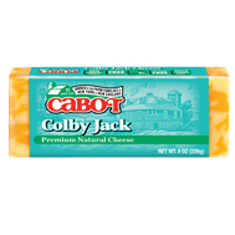 A bold and creamy Lactose-Free Extra Sharp Cheddar with a Northeast Bite! This cheese delivers lush and rich taste in a mellow, well-defined, slightly crumbly body. Balanced flawlessly, this artisanal-grade cheddar whispers with subtleties that are evocative of our farmers’ valley fields. 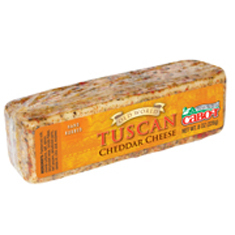 As in the best cheddars, classic sharp notes linger appealingly through each bite. Aged for two months or longer, these sprightly young cheddars provide an ideal backdrop for our popular gourmet flavors. Versatile and varied, these flavored cheddars are perfect for creamy soups or classic canopies, hot hors d oeuvres or simple snacks, quiches or tarts, quesadillas or pizza. Not many people would have to be talked into trying this flavor combination. 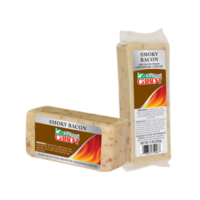 What’s not to love about hickory smoke, cheddar, and bacon? Full-flavored and hearty, our Lactose-Free Smoky Bacon Cheddar is superb for slicing and snacking. Or try shredding it to elevate a plain baked potato into a gooey, smoky, cheesy masterpiece. Blistering hot buffalo wing sauce flavor is hand-rubbed into our cool and creamy cheddar. 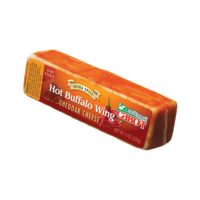 The spicy exterior of our Lactose-Free Hot Buffalo Wing Cheddar is a blend of hot chilies, garlic, onions, and sweet cream for a combination you will call crave-worthy. 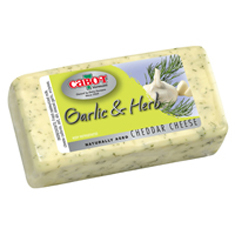 Slice it and serve it on a grilled chicken sandwich or fold it into a wrap for a hot and savory cheddar burst. Hand Rubbed Delizioso! 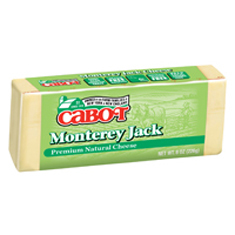 Layers of healthy, tasty Tuscan herbs and spices smother Cabot’s newest classico cheddar. Ideal for snacks, pizza and just pure enjoyment. A sensational combination of healthful, roasted garlic and minced natural herbs, these two garden favorites blossom in this glorious, flavor-filled mixture. For more information on where to purchase, click. 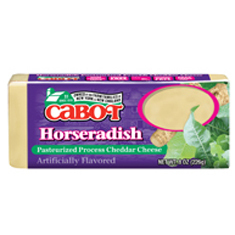 The biting pungency of horseradish is foil to our smooth, nuanced, youthful cheddar. For an incredible, tasty zing, pile it high on a baked potato or slice it for grilled meats, sandwiches and side dishes. Pow! Ole! Our fieriest chili concoction yet features habanero and jalapeño peppers. Tastebuds and sales have heated up as people discover the flavor that took home top honors as the “Hot Cheese” at the Fiery Food Challenge. Give a boost to burritos and a spice to souffles. The first, and still foremost, light Cheddar on the market. 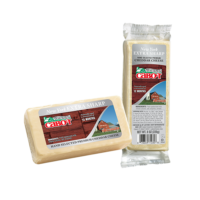 These award-winning Cheddars will melt in your mouth and on the grill! With one quarter the fat, one-third the cholesterol and half the calories of regular cheddar, this cheddar lights the way for those with dietary concerns. Best of all, it tastes 100% cheddar and melts like a dream. 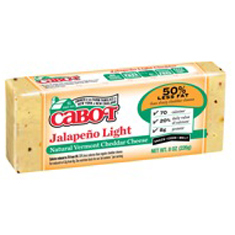 Cabot’s Light Cheddars keep winning in taste tests nationwide. Why? Because we know how to craft great cheddar. One 1-oz serving has just 70 calories & 4.5g fat. “Less fat -not no fat- means better flavor and texture. 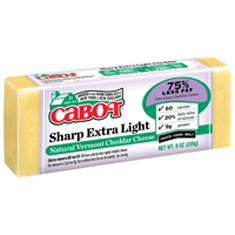 We like Cabot the best.” – Cooking Light magazine. 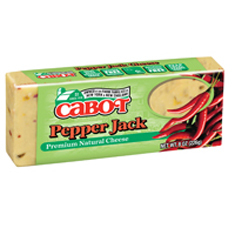 Same fabulous Pepper Jack cheese- jalapeno peppers and half the fat.